We are pleased to announce the first course in the CHOICE fall schedule, 'How To Use VPhot' is now open for registration. This course is designed to teach observers how to use VPhot, the AAVSO’s cloud based photometry reduction software. 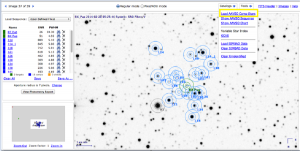 You will learn how to upload and manage your image files, how to perform photometry on single images and time series, how to save your analyses and how to submit your results to the AAVSO. You do not have to own a CCD or have your own images. Sample images will be provided. You must successfully complete exercises and weekly quizzes as well as a final examination to pass the course. This course is only available to AAVSO members. If you would like to join the AAVSO click here. If you are already a member and would like to take the course click here to register. The remainder of the CHOICE fall schedule will be announced soon.